Bedside data entry with Critical Care physicians on duty 24/7. Intensive Care provides the highest level of nursing care to Trauma, Neurosurgery, Orthopedics, General Surgery, and Internal Medicine. The multi-disciplinary teams consist of Registered Nurses, Registered Respiratory Therapists, Social Workers, Case Managers, Physicial Therapists, Occupational Therapists, Speech and Language Pathologists, Intensive Care Nurses, Social Workers, Dieticians, and Nutritionists. Our Critical Care team works in conjunction with Emergency Medicine physicians and staff so that every patient receives the correct level of care. When a patient is critically ill, they need special care in our 50-bed Intensive Care Unit. We meet their needs and provide a private room with big sun-lit windows and state-of-the-art technology including bedside data entry. The care here has been amazing. All the nurses, they really seem to love their jobs. They are here for the patients to ease their pain and they are here at your side all the time. They are able to help your needs at a moment's notice. I was fortunate to have excellent nurses here. - Zeth Aho, patient. A specially trained staff of surgeons and Critical Care physicians are on duty 24/7. Our Critical Care team works in conjunction with Emergency Medicine physicians and staff so that every patient receives the correct level of care. 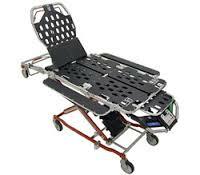 Funded through a grant from the Volunteer Congress Fund, UMC's Foundation purchased a Bariatric and General Use Stretcher so that when a patient is ready to be moved from ICU, the bariatric stretcher is easier for one person to manuever rather than a bariatric bed. This important piece of equipment helps 1,825 patients annually. Entirely funded through University Medical Center's Foundation, the Healing Arts Program integrates dynamic and inspirational art from local and regional artists in every area of the hospital including the Intensive Care, improving the hospital experience for patients, families and caregivers. Donors interested in more information on Intensive Care donor opportunities that impact our community's population can email donate@umcfoundationelpaso.org or click here to donate now. Foundation volunteers provide amenities and special support to Intensive Care patients and families. To learn how to become a volunteer, email volunteer@umcfoundationelpaso.org.